Rory McIlroy admitted he may need a Masters miracle to make his Grand Slame dream come true today. But that was before he saw Jordan Spieth wobble down the stretch and a late Justin Rose birdie guarantee he'd play with Tiger Woods in the third last group. The world No 1 was devastated to storm to six under for the day through 15 holes only to bogey the 16th and 18th for a 68 that leaves him tied for fifth with Woods, Kevin Streelman, Kevin Na, and Dustin Johnson on six under par, 10 shots behind Spieth. But in a twist of fate, McIlroy is now the same number of shots behind Spieth that Charl Schwartzel trailed him by before he imploded with that 80 in 2011. In fact, McIlroy was also 10 behind before he surged through the final in the final round to win the BMW PGA last year. After storming to the turn in 32, McIlroy came home in level par with birdies at the 13th and 15th cancelled out by those late mistakes. And he admitted that it’s the unforced errors that are holind him back as he slowly but surely comes to terms with Augusta National. Dismissing the notion the the pressure of trying to win the Grand Slam had cost him he pointed to “silly mistakes” as the key to his Masters mishaps. His problem with the par-fives certainly seems to be solved after he played them in 11 under par for the first three rounds. “I definitely feel like I play this golf course better and better every year that I come here,” McIlroy said before it was later confirmed that the will be paired with Woods today. "I just need to keep putting numbers up like I did today. As for his day, he said: “I got off to a good start, sort of the way I wanted to play the front nine. I had not really played the front nine too well the last couple days, so to play them under par is nice. “I made a couple good birdies on 13 and 15. Felt like the other holes on the back nine were playing pretty tough with the pin positions and a bit of a swirling wind. Northern Ireland’s four-time major winner started the day 12 shots behind Spieth on two under par but after missing a 15 footer for birdie at the first, he reduced the par-five second to a 338-yard drive, a six iron and a 37 foot putt for eagle. Suddenly he was just 10 behind but he having missed another chance from 12 feet at the third, he got up and down brilliantly from the front bunker to save par at the fourth, holing a crucial 13 footer to remain inside the Top 10. Had he had a hot putter, the world No 1 might have frightened Spieth as he prepared to go out. But he missed a 15 footer at the fifth, two putted the short sixth from 25 feet and then missed an eight footer at the seventh following a brilliant second. But he was soon back on a roll, blasting two huge shots into the middle of the par-five eighth before two putting for birdie. When he rolled in a seven footer to birdie the ninth and turn in 32, he was just eight shots behind Spieth on six under. But there were more fireworks to come on the par-fives that had proved so elusive last year. At the 13th, the Holywood star two putted from nearly 50 feet for his four and then got lucky at the 15th. Forced to hook his 205 yard approach around the pines on the left, he urged his ball to “go” and breathed sigh of relief as it pitched in the banks stuck there thanks to the overnight rain. A chip and a putt up the hill got him to six under for the day and within seven of Spieth on eight under. After coming up just short off the green, he hit a fine pitch to around eight feet but lipped out and ended the day with 31 putts — a few more than needed to contend at the highest level. McGinley on Rory at Augusta: "It was like a guy going around the racetrack in NASCAR — the more he presses, the more he is going to spin off now and again"
Forget about the difference in their putting, did Rory McIlroy bow to Jordan Spieth at the Masters because of the same mistake he made in the Open at St Andrews five years ago, pressing too hard too soon? Rory McIlroy might feel he can perform a final round miracle with a closing 62 and challenge for the US PGA but his optimism about the final round came before Jordan Spieth closed in on Jason Day with a finish that suggests that he may well be world No 1 before Sunday is out. 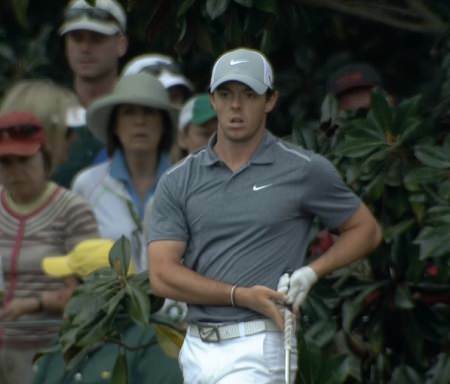 For the first time in his career Rory McIlroy got a close-up look at Tiger Woods inside the ropes. Rory McIlroy and Tiger Woods during the Turkish Airlines World Golf Final in Turkey. 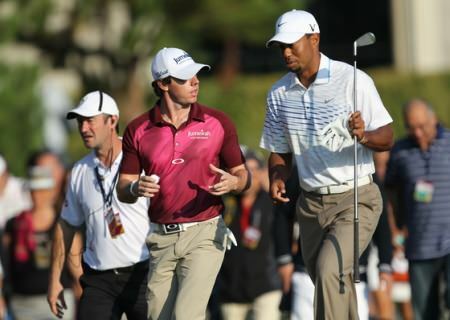 Picture: Fran Caffrey/www.golffile.ie.Tiger Woods doesn’t believe he has a rivalry with Rory McIlroy. He’s right. McIlroy has been pretty much untouchable by anyone when he’s found his “A game” this year. Rory on Tiger and 'drop-gate' - “I thought it was questionable"
Rory McIlroy anxiously watches an iron shot at Augusta NationalRory McIlroy might think Tiger Woods’ escape from Masters disqualification was “questionable” but he believes he’s closer than ever to coming up with the right answers to his own Augusta inquisition. Spieth braced for Major test: "I can’t rely on the putter to save me with two major champions right behind"